Is crowdfunding the future of music? 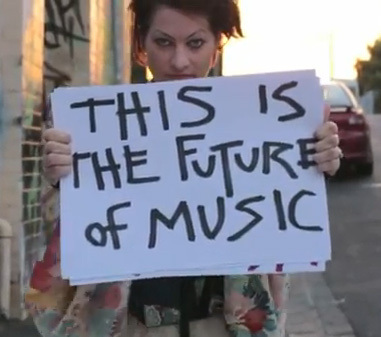 Those interested in alternative business models for the music industry may have heard about singer Amanda Palmer‘s astounding success in crowdfunding her next album through Kickstarter, where she managed to collect $1.2 million USD in donations from her fans. Whichever way you look at it, this is an incredible achievement which will certainly be cited as a watershed moment when the history of the modern music industry is retold. Unsurprisingly, many have been quick to claim that the Palmer experiment is the way of the future (no need to point fingers, you may have read the same articles too). It is not my intention to diminish Palmer’s accomplishment, but it would be a mistake to believe that this is somehow typical of how corwdfunding will work in the future for musicians. Amanda Palmer has been working hard her entire career, she has made connecting with her fans a priority, and being the second half of Twitter royalty does not hurt either. The truth is that other artists should not go into Kickstarter thinking to easily replicate this story. What is really happening is that the Amanda Palmer experiment is the outlier that demonstrates changing trends in the music industry. Digital sales in the UK have now overtaken CD sales, some sectors of the music industry are finally getting their act together (about 12 years late), and more artists are considering alternative models. But is crowdfunding a serious alternative for struggling small acts? A small sample at Kickstarter seems to offer mixed results. As of writing, there were 802 projects asking for very different sums of money. The 38 “Staff Picks” still open averaged around $4,300 USD, with a large number of successful acts surpassing that. This seems good enough to keep some of the music flowing, and there are definitely lots of successful stories in the site. However, the sample is too small to make any conclusions, and Kickstarter is certainly a North-American phenomenon. Similarly, the biggest hiccup of announcing Kickstarter as the future of music is the fact that it is a curated site, they receive 2,000 applications each week, and only approve 60% of them (seemed less from my own sample). There are other crowdfunding options, so this is definitely a growing market. It seems clear that the debate has shifted, but it is too early to declare the death of the music intermediaries. The music industry has always fulfilled the role of content curators, and even in the information age there is need for someone to filter out the rubbish and tell us what might be worth listening to. The interesting thing is that Kickstarter is the new content curator. I have a great idea for a llama-themed band, I wonder if anyone will let me launch it.